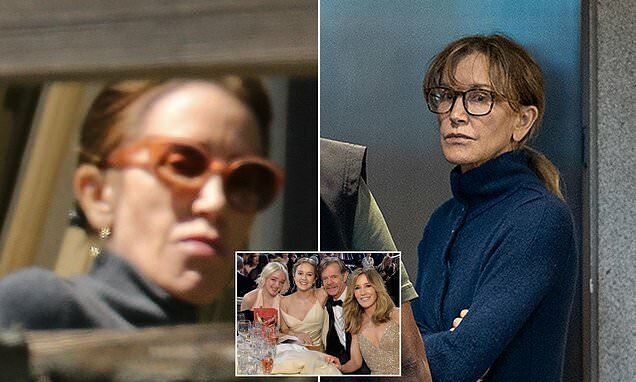 Felicity Huffman was spotted for the first time since she was bailed from jail for her involvement in an explosive college admissions cheating scandal, peering out from her home with a stony face and an icy glare. The Desperate Housewives actress emerged from her LA Hollywood Hills home with a serious and calloused expression on Thursday. On Tuesday evening she was released from jail after posting $250,000 bond and surrendering her passport. The follow day she holed up in her sprawling home and emerged Thursday afternoon in sunglasses that couldn't hide her piercing stare. The 56-year-old star is accused of paying $15,000 disguised as a charitable donation to scam 'charity' Key Worldwide Foundation to help her eldest daughter cheat on the SAT. In December 2017 her daughter Sofia Grace Macy, 18, took her SAT college admission test at a separate testing site instead of taking it at her school - Los Angeles High School of the Arts. There someone changed the answers on her test, helping her score a 1420 out of 1600, a 400-point improvement from her PSAT results just one year prior. Soon after the proctor was paid $40,000 by Key Worldwide Foundation, the same organization that Huffman would later give a $15,000 donation to, according to the documents. Charging documents state that both Huffman and her husband, actor William H Macy, agreed to the plan to help daughters Sofia. They allegedly discussed using it again for their second daughter Georgia, 16, but decided against it. What would the Cossacks say? If you had told this story to a Jew sixty years ago, he or she would have said: “Stop. Scarlett Johansson and Brie Larson Dish on Cringe-Worthy First Kisses First kisses are sometimes worth forgetting. Will Smith plays an elite assassin who becomes the target Will Smith has an epic battle in the upcoming movie Gemini Man.